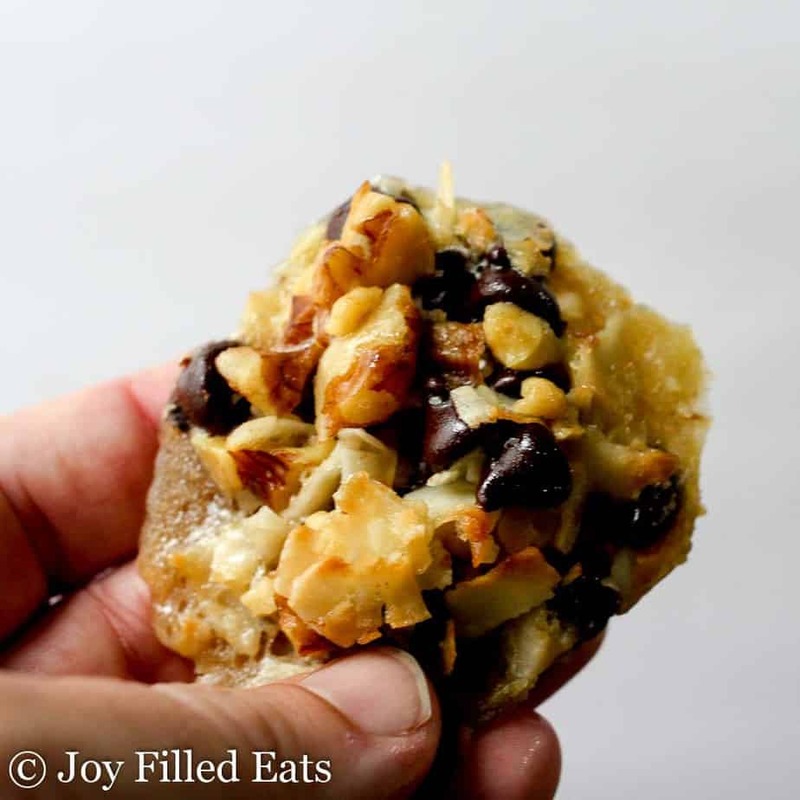 These Keto Five Minute Magic Cookies take all the flavors of my popular Magic Cookie Bars and turn them into a cookie that mixes up in only 5 minutes. 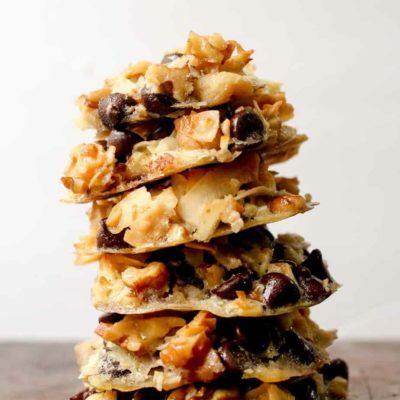 With chocolate chips, coconut flakes, and walnuts these are my new favorite easy recipe. I love simplifying recipes. As a mom of four with number five arriving within the next month simple is key. 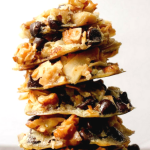 I love my Magic Cookie Bars and I consider them a fairly easy recipe but the prep for those is about 25 minutes when you consider having to cook the sweetened condensed milk. And then that’s an additional pot to wash. I wanted a simpler version for when I don’t already have a batch of condensed milk ready to go in the fridge. These magic keto cookies are so easy and flavorful. 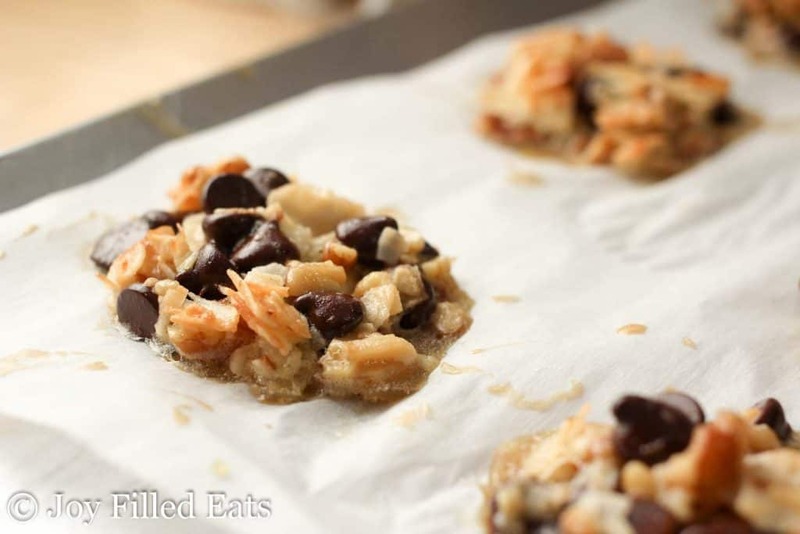 The taste exactly like Magic Cookie Bars without the crust. And that’s what they are. 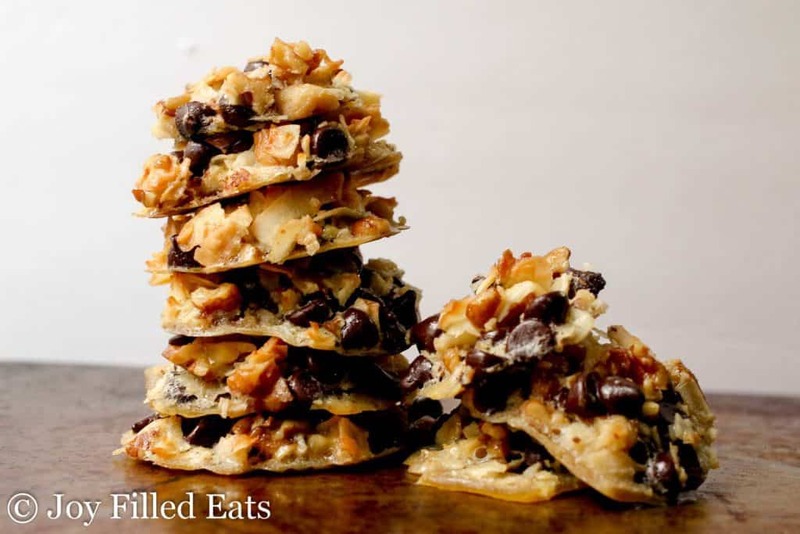 Crustless magic cookie bars. They are going to be my new go-to dessert to hide in the back of my fridge where my kids can’t find them. Feel free to customize these keto cookies to your tastes. Don’t like walnuts? Use pecans. Don’t like coconut? Use extra nuts. The main thing is to have 1.5 cups of mix-ins. 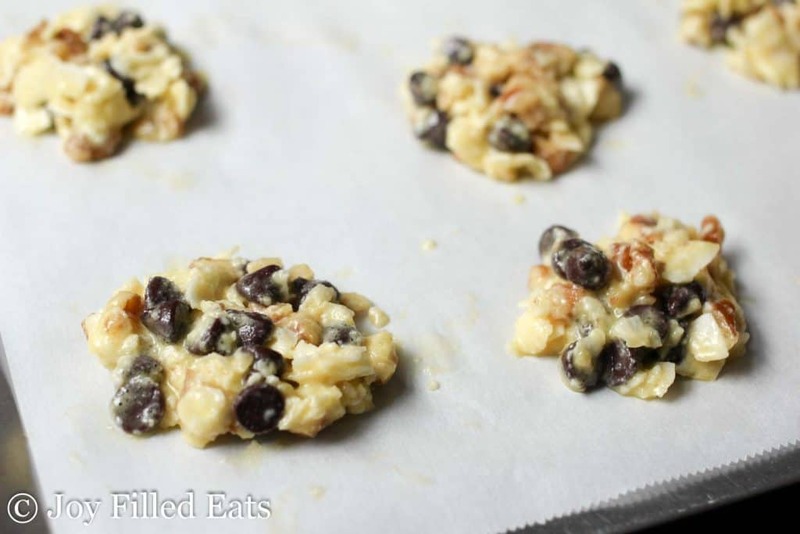 I’m planning on trying these with white chocolate and unsweetened dried cranberries this fall. Feel free to use different nuts, chopped milk chocolate, or any other type of yummy sugar-free sweet in these magical keto cookies. Coconut Cream – Coconut cream is the thick part of coconut milk. It either comes in small cans or you can refrigerate a can of regular coconut milk and just use the solid part. Unsweetened Coconut Flakes – these are the larger coconut chips, not the finely shredded coconut. These have a chewier texture that is great in granola, cookies, and trail mix. Can I make this into a keto cereal? Yup! If you cut back on the chocolate and sweetener you can also make this into a granola type cereal. It is similar to my granola recipe here. Note: Don’t be disturbed when they look like this coming out of the oven. Just trim off the excess and enjoy your cookies. And go ahead and eat what you trimmed. It tastes like vanilla custard. You can also bake these in greased aluminum cupcake papers to avoid this step. UPDATE: Since posting this recipe I have had readers make these keto cookies in a muffin tin and aluminum cupcake liners to avoid the runoff of the custard. 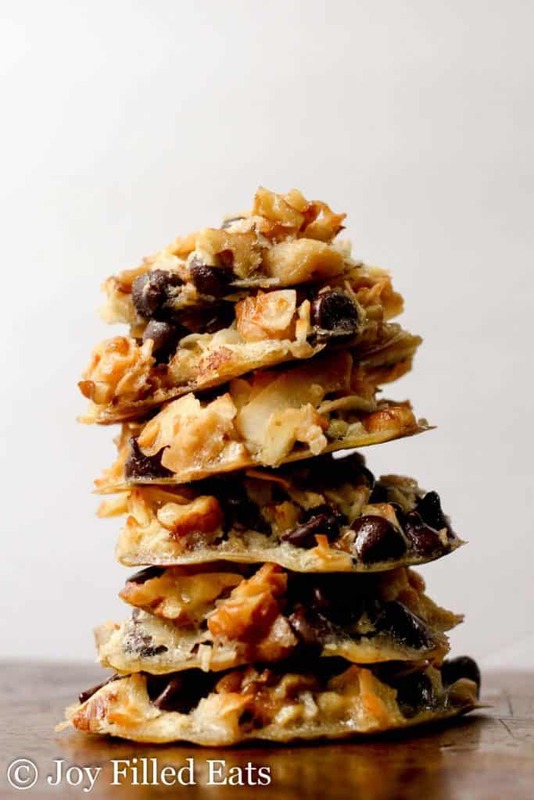 These Five Minute Magic Cookies take all the flavors of my popular Magic Cookie Bars and turn them into a cookie that mixes up in only 5 minutes. 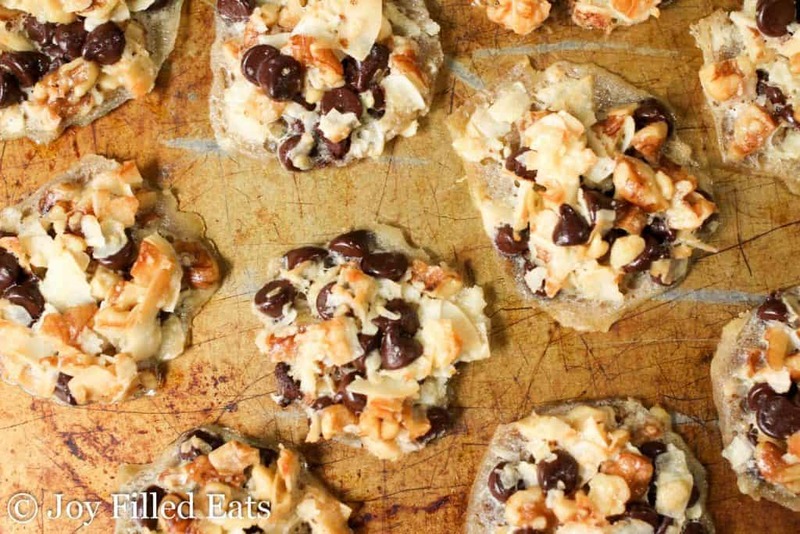 With chocolate chips, coconut flakes, and walnuts these are my new favorite easy recipe. Stir together the butter and coconut cream until smooth. Add the sweetener and egg yolks. Mix well. Add the rest of the ingredients. 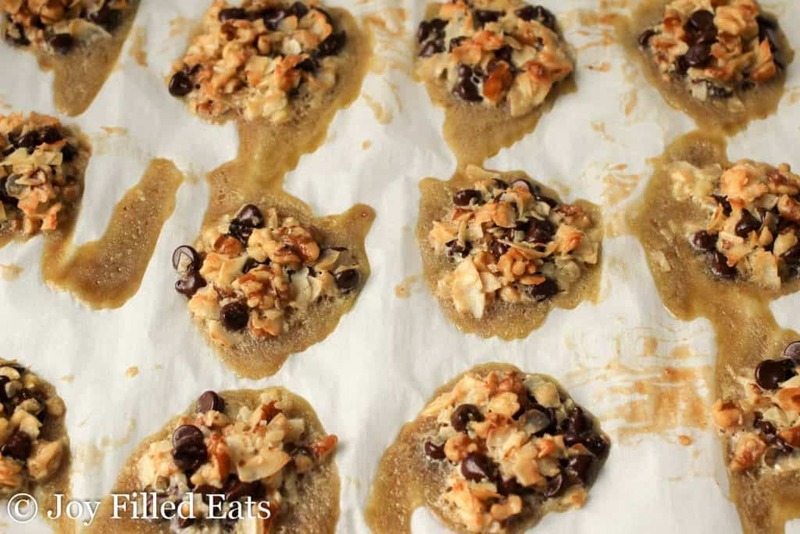 Scoop onto a parchment lined baking sheet to form 12 cookies. Press down to flatten the tops. *** You can buy small cans of coconut cream or refrigerate a can of full-fat coconut milk until it separates. For this recipe, you need the solid part of the coconut milk. Originally Published August 17, 2017. Revised and Republished May 25, 2018. You might have you used the wrong type of coconut cream. Does it come in little cans or a solid brick? The coconut cream I use in this recipe is just the thick part of coconut milk. It is never 'hard' like the creamed coconut in boxes. I do mention the runoff from the custard in the blog post. If you bake this in silicone cupcake pan this does not happen. If I want it to look like cookies I just trim off the extra after baking. I really do think it was the coconut cream. That should not have happened. I wonder if the can of coconut cream was very cold during transit at some point. That may have made it separate so thoroughly and get hard. Trayn~ Thanks for your replies; I don't think it's the coconut cream as I have had several cans of each kind ~( and wasted several cans) maybe it's my cold house, I will have to check this summer and compare. A friend just shared this recipe with me and I'm so excited about them! I was curious, though, after you scoop off the coconut cream, is there anything you can do with the remaining liquid in the can? It seems like a waste to throw it away, but I wasn't sure what it actually was and what you could do with it. :) Thanks!!! I'll put it in smoothies, add to soup, or add to my coffee. What is it, though? Coconut oil? No, it's just skim coconut milk. Or it's called coconut water. Once you remove the cream the skim milk is left. I have tried these twice with heavy cream instead of coconut cream and cook in silicone muffin pan. They are delish but fall apart. What am I doing wrong? I do live in high altitude so not sure if that impacts this? I'm not very familiar with high altitude baking. You could add a whole egg to help them hold together. This is my go-to Keto cookie. I love them. Has anyone tried this in a muffin tin with parchment liners? Thanks so much for the recipe, can't wait to try it! Theses are delicious! I did sub heavy cream for the coconut cream as that was what I had on hand. Baked in parchment paper liners in a muffin tin and turned out perfectly. Thanks Taryn! Hi Taryn, did you use salted or unsalted butter in this recipe? Thansk! They keep for weeks in the fridge or freezer. I have made these numerous times since finding your website. They are a hit with everyone! Thank you for your time in making these great desserts! The nutrition facts are for one cookie. There are 0 grams of sugar. How much erythritol would I sub for the sweetener the recipe calls for? You would need twice the amount listed. I never leave comments but I thought some might like to know that this does work with heavy cream! I used 2 Tbsp. Also, I used Monk sugar (1/4 cup + 2 Tbsp.) and added some real vanilla. Turned out great! Also, I baked them on a silipat baking mat and did not have a problem with the cookies running. Reduce cook time by 2-3 minutes. Yummy! Thank you for the tip, Paula! I was wondering about using cream. Thank you! I will try these. Yay! I was about to ask if this would work with heavy cream! Really wish I would have found this recipe first!! There is an 'adapted' version on delish.com that fails terribly. It uses both coconut oil and butter with no coconut cream, and it ends up as little islands floating in a sea of melted oil. Good thing I used a jellyroll pan! Major fail! Yes, isn't that annoying?! Delish basically stole my recipe, edited it (probably without recipe testing), and reposted it. They only credited me at all when I saw it and contacted them. The nutrition facts are calculated for 1 cookie. Has anyone one used maple syrup as a sweetener? 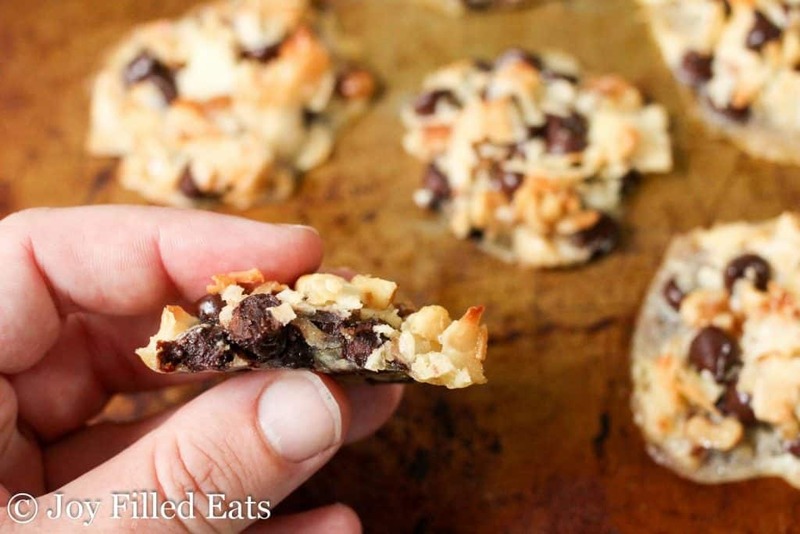 Great base recipe for easy, healthy cookies! I made some modifications to include adding goji berries, which have less carbs than cranberries and forgot to add the chocolate, and they still very good. Thank you for sharing. Thanks for the tip about goji berries! These are absolutely delicious. My entire family loves them, including my non keto kids. My husband has had some each night. I make them with macadamia nuts :) Thank you for the recipe. Ignore I don’t have coconut cream what are some alternatives? I have not tested this with any alternative ingredients, sorry. I looked up alternatives for coconut cream and you can substitute with light cream. I used light cream and turned out perfect! Thank you! I'm glad to hear cream worked. I've been hesitant to suggest it without testing the recipe with it myself. I used evaporated coconut milk, light had less then 1 carb 0 gram sugar and reg had 2 carbs with less then 1 gram sugar. I had no problem with the runoff using the evaporated coconut milk. I found this by accident cuz I couldn't use coconut cream and was going to use the evaporated milk to make coconut cream but couldn't wait long enough, LOL. I use the same amount of evaporated milk as the recipe called for coconut cream. Light cream has more fat than half and half but less fat than heavy whipping cream. I was wondering if I could use my silicone muffin pan so thanks so much for sharing this! Did you have to grease them first? I would spray them lightly with cooking spray just to be safe. Could I use coconut oil instead of cream? I don't think coconut oil would work in this recipe, sorry! Hi! Do you think coconut sugar could be used as a replacement? Maybe. Sorry, I can't guarantee it but without testing it myself I don't like to do that. You will need more. Maybe 1.5 to 2 times as much. If you try please LMK how they turn out! I have made these several times and they have turned out perfect everytime. These are definately my favorite keto sweet treat!! Thank you so much for your recipe. These just look delicious! I'm not following a keto diet...but that wouldn't stop me eating one of these. Who am I kidding..... 4 of these ;-) Can't wait to give them a go. Hi Candy, I'm sorry this recipe didn't work for you. I am always happy to help troubleshoot. Could your oven temperature be off? Which sweetener did you use? I have to cook mine for much less time. 12 mins at most! Thanks for your Great recipes. I have a question When using coconut cream in a tin do you shake the can & measure OR do you just open & use the more solid part & discard the liquid like you do for the cream from chilled coconut milk ? When using coconut CREAM I never know what to do. Also have you used tinned coconut cream for whipped coconut cream instead of the solid part of coconut milk? Thank you for your response & help. We have something similar in Sierra Leone and I absolutely love them. Thanks for the memories. I never comment online but I just have to on this one- these are ridiculously delicious! The bonus is a Keto friendly dessert that’s actually easy and quick! Even my husband loves these! Thank you! Can I use erythritol for the sweetener? Yes, I think so, but you will need twice as much. I used Erythritol and didn't double the amount. Turned out perfect. Tried in the muffin tin but they stuck terribly. Maybe a cupcake liner would help. Will try that next time. There will definitely be a next time. This is a delicious keto treat. And, so quick and easy. Thank you for a great recipe. Do I have to use any sweetener at all? Why? You can leave it out, I think it will work without it. But you will need to use about half the coconut cream since there is less to absorb it. what can I use in place of the 2 egg yolks? Flaxseed maybe? I'm sorry but I think these really do need the egg. You could just melt a little sugar free chocolate or raw cacao to hold the mix-ins together. More like a candy than a cookie but out would have similar flavor. Looks so good its making me Hungry! ! I made these and they turned out amazing! I plan on freezing them for post baby nursing snacks. I also plan on making a double batch and adding brewers yeast to boost milk supply. I already doubled the recipe and now I’m making it again 😂 Yummy recipe! Adding brewers yeast is brilliant for nursing mommas!! I may use that suggestion in my nursing support group. I have made these cookies about 10 times now. They are my go to sweet treat for my daughter that dose a Modified Atkins diet for epilepsy. I have used splenda, erythritol, Xylitol all three worked great. They erythritol & Xylitol are granular so I use my coffee grinder to make it powdered. I also just use one whole egg instead of 2 yokes. And whipped the whole can of coconut cream them froze what was left in ice cube tray. I too use foil cupcake tins. They are amazing thanks for the recipe. You have used Just Splenda and it works good? I made them and baked in silicone muffin cups. They were very loose when they came out so I froze them. OMG soooo good!!! My husband and I just each had one frozen, popped right out from the liner. We both agree they tasted kind of like a Girl Scout Samoa-ish. Great little snack when I need a sweet! I’m horrible at figuring measurements out. If I were to use stevia granules (stevia in the raw) how much would I use? I'm not too familiar with that blend. Is it just stevia or does it have erythritol? Does it measure 1:1 For sugar? How much is one serving.. one cookie? Delicious! I’ve made them 3 times since discovering the recipe. Thank you for sharing!!! I used a mixture of 85% chocolate and thm chocolate chips and they all melted as soon as I added them. They are basically chocolate cookies now, and I waited several minutes before adding them to allow the mixture to cool a little. Any tricks to keep these at a quick 5 minutes? I'm not sure why they would've melted. Did you heat the coconut cream and butter? They should just be room temperature, not hot. Other than my coconut cream not being soft (it's packaged in a block), I'm not sure why I interpreted it that way! I was certain you had to heat the butter and coconut cream to get them to mix. Thank you, I'll try again! I did this too! But they still tasted good! Has anyone mentioned yet that if you refrigerate the dough (or pop it in the freezer for 5 minutes) that they won't melt in the oven? No, did you try that? That's great! I have had people make them in cupcake tins to avoid the custard running off like mine did. I don’t use artificial sweeteners such as THM sweetener blend. Can I use either white or brown sugar instead? I'm not sure if they would work. Sorry. If you try you will need extra since this stevia blend is twice as sweet as sugar. The sweeteners I use are natural. Stevia is a plant and xylitol comes from a birch tree. I love how people assume that if it isn’t sugar it’s not a natural sweetener. I’ve learned so much from going low carb! Love this recipe!! Taryn, Thank you for this recipe. I made it last night (with pecans and chopped 85% dark choc) in order to have something to eat instead of dessert at our church luncheon today. The cookies are delicious! My husband says they are better than regular (non THM) brownies! Hi Taryn, these cookies look delicious. I am baking for someone who is dairy free, do you think they would work using coconut oil? Your recipes look awesome! I'm so glad you have low sugar , gliluten free and some dairy free options! I love that you do pecan pralines, toffee and other caramel type desserts low sugar!!!! Thank you for being so generous to share them! Can you use Swerve instead? If so, how much? I think swerve would work but I haven't tried it. You will need more. Maybe twice as much. These look great! Could I use honey for the sweetener instead? I'm not sure that would work. If you decide to try cut back on the coconut cream and bake them in a silicone muffin tin or a baking dish. They'll probably spread too much otherwise. They were delicious!! Thx for the recipe! I made it into one rectangle and then cut it into 12 squares after baking. Really good!! Mine didn’t hold together well prior to putting in oven. It was very liquidity. Maybe I’m doning something wrong? Was your coconut cream pretty solid? This is where I messed up. I used the coconut cream you buy beside the alcoholic drink mixes, not even looking at it! 49 carbs in 1/4 c!! Also, very liquidy, so my cookies didn't even hold together well. I found myself thinking, "Flatten them? They are already flat!" lol I learned from my mistake, and will make these again as my husband and I loved the taste. Thank you for such a tasty recipe. I found the recipe worked best for me to double the nuts and shredded coconut. Look yummy, and I can't wait to try! Would heavy whipping cream work instead of the coconut cream? Wasn't sure of the cc consistency/thickness vs hwc. Thanks for the new recipe! I don't think heavy cream would be thick enough. They might work with 3 tbsp butter and 1 tbsp heavy cream. Or a nut butter could work but would change the taste and texture a bit. You have to subtract the sugar alcohols. My fitness pal doesn't do that so I do it manually. 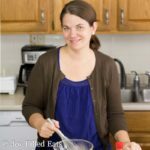 Is there a way I can modify your dessert recipes to only use Stevia? The other on plan sweeteners make me sick. Would I have to change the amount of liquids I add to it? Not yet. Unsweetened cranberries are ok since their sugar content is pretty low. I bought the coconut cream from a link on Facebook. I plan to use it in these bars and your Raspberry Truffle Bark both of which sound yummy. Can i use it in place of sweetened condensed milk in other recipes? Adding sweetener of course. I think so. I haven't tried yet. You might have to reduce it a little further by cooking it with the sweetener. What can you substitute for coconut cream? I have not tried with other ingredients yet. I don't think heavy cream would be thick enough. They might work with 3 tbsp butter and 1 tbsp heavy cream. Or a nut butter could work but would change the taste and texture a bit. No, but I think coconut butter would work in this. Oh my gosh! Brilliant idea. I love the simplicity and quickness. Thanks! Taryn these look delicious and I have all the ingredients! Do I need to refrigerate the coconut cream or use at room temperature? thank you. It is twice as sweet as sugar. Anything you can use to substitute for the coconut cream? Do you think they will bake ok without the sweetener? I'm not sure. They get a little sweetness from the chocolate but probably not enough. Can you use coconut butter instead of coconut cream? I think so. I would warm the coconut butter a bit so it is easier to mix in.